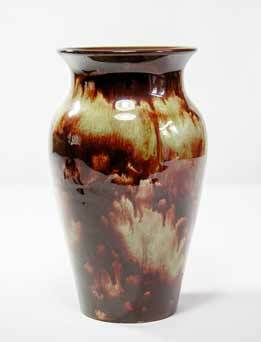 Ewenny vase - 8⅜" (212 mm) high. There have been potteries at Ewenny in South Wales for hundreds of years. The two major companies producing in Ewenny today are the Ewenny Pottery and the Claypits Pottery. Ewenny Pottery is the younger, having been founded in 1815. The origins of Claypits are shrouded in the mists of time; it is at least a hundred years older, possibly much more. A Claypits apprentice, Evan Jenkins, set up the Ewenny Pottery and the company has stayed in the possession of the Jenkins family to the present day. Jenkinses were also involved with the management of Claypits Pottery. The potteries of Ewenny were traditional country potteries using unsophisticated equipment and local materials. Naturally, around the turn of the century they found favour with followers of the Arts and Crafts movement, notably Horace Elliot, and this led to their work being seen by a wider circle of people. Ewenny pots are usually in red clay with slip or mottled glaze decoration. Examples are abundant, making it a good choice for the new collector with limited resources.